As BTS's presence at The Grammy has gained lots of traction from all around the world, it has been said that BTS's V has been featured on an online magazine with his appearance again. HIGHSNOBIETY, a globally famous fashion and lifestyle magazine that attracts 100 million monthly views selected V as "the most daring" look among the celebrities who attended the star-studded awards. 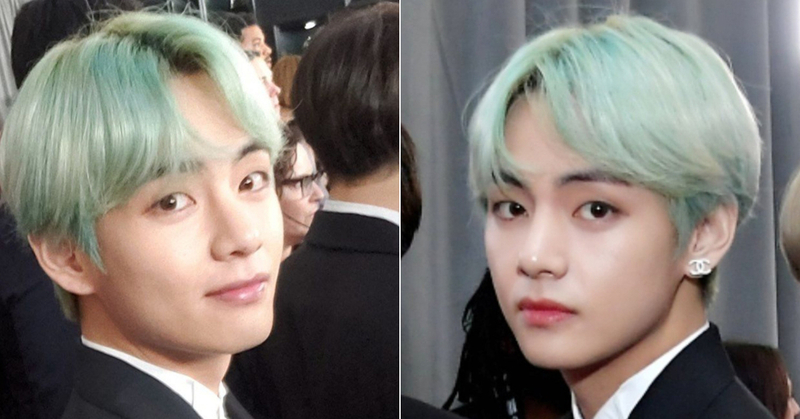 The magazine described, "BTS V, a member of the South Korean pop band BTS, had arguably the strongest look of the night. His mint green heavily banged do was easily the most talked about on social media too". Featured on the list are some of the top-notch stars such as Drake, Travis Scott and so on. The fact that V is ranked with such big names seems to make fans more proud. On top of that, even a world-famous fashion magazine Vogue also commented highly of the 23-year-old star by saying, "Yet Jungkook, Jimin, Jin, J-Hope, Suga, RM, and V looked better than ever tonight, particularly V who had dyed his hair a pale mint green for the occasion". V always gets to be the one who catches people and the media's eyes with his fascinating look. His ever-changing style is being looked forward to by people all over the globe.